We offer Free-To-Air satellite TV system systems. Call for a price on a system for the channels or channel you wish to receive. See a list of channels and languages below. SATPRO Atlanta is one of the few companies that installs HH Dish Motors ! 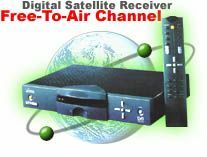 The concept of receiving free to air satellite signals dates back to the inception of satellite broadcasts in the mid 1970's and 1980's where large C/Ku band satellite systems were a popular way of tapping into hundreds of available channels from the sky. The downside to these systems were extremely large dish sizes and expensive equipment. These made satellite systems prohibitive for many people. However over the years, increasingly powerful commercial satellites and improvements in technology have brought prices and dish sizes down quite dramatically. The mid 1990's saw the introduction of digital direct to home technology, which for the first time allowed main stream users to access a wide variety of channels not available via their local cable company, while enjoying incredible picture and sound quality, all from a dish far smaller than had ever been seen before. The small dish revolution nearly caused the extinction of the large dish industry, which simply could not compete on dish sizing, price or ease of installation. The late 1990's saw the digital revolution spread to the large dish industry with services such as 4DTV which brought the same digital picture and sound as the small dish systems to large dish users, although a new and expensive decoder was required. The last several years has seen most broadcasters switch their broadcasts to digital, which allowed broadcasts to be compressed, allowing more channels per satellite transponder and also a superior picture and sound quality. As well, a common digital standard known as MPEG2-DVB has been adopted by many broadcasters, which allows all free to air satellite channels that use the DVB (Digital Video Broadcast) standard to be received from one satellite decoder. Over the years, the free to air market has begun to see a small comeback, primarily due to an abundance of programming not available anywhere else, such as many international and foreign language channels. There are also many sports and news feeds and a few network channels as well as many interesting and private channels to view. FTA TV also makes a fun hobby. FTA does not replace pay satellite service or cable TV service. What Do you Need For FTA Reception? In order to properly receive free to air satellite signals, you must have a clear view to the satellites. In North America, you need to have a relatively clear view to the southern sky. Obstacles such as tall buildings or trees or mountains will severely impair or make reception impossible. If you are only interested in signals from one or two satellites, you will more than likely be able to locate your dish in a location favorable to reception of the desired satellite. If however you wish to receive multiple satellites, you will need an unobstructed view. A do it yourself site survey with a compass and a satellite location chart or a professional satellite site survey will determine your eligibility for free to air reception. If you live in an apartment you will need a patio or balcony facing southwest for satellite G25 (T5, IA5) and its international programming. This of course is the most important part of your system. There are currently several different digital broadcast formats, however most free to air broadcasts use the common MPEG2-DVB format. If you intend on using your DVB receiver for pay programming such as on GlobeCast or WorldTV, you will need a smart card and a subscription, both of which are available from the satellite service provider. North American direct to home services Dish Network and DirecTV cannot be received via a DVB receiver as they use proprietary equipment. However, for most North American free to air applications, you will need little more than a quality free to air receiver. If you wish to record your programming, you may wish to invest in a free to air receiver with a integrated personal video recorder (pvr), allowing for dozens of hours of recorded programming. Additionally, there are a number of things to be taken into consideration when choosing a satellite receiver. Also if you are interested in looking for hard to find channels or "wild satellite feeds", then you may want to invest in a receiver that has a blind search function which will scan an entire satellite for all channels on all bands. As well, you will want to ensure that your receiver has a fairly fast processor, some can take 1.5-2 seconds to change between channels which can be painful. systems can be defined as a satellite system primarily designed to receive "in the clear" or unscrambled satellite broadcasts. At the present time, there are literally hundreds of channels of news, sports, networks, special interest programming and ethnic channels and foreign language channels that are available without a subscription. The selection is also constantly changing, with new channels coming online and some old ones going offline or changing their broadcast schemes. In the past 5 years, most broadcasters have switched their broadcasts to digital, although there are still a few analog broadcasts. In order to receive most Ku band signals in North America, you will require a minimum of a 30"(75cm) Ku band satellite dish antenna for the Atlanta area.. For fringe area reception or reception of signals outside of a satellite footprint of some satellites, or locations with an abundance of trees, you will need to upgrade to a larger dish size. Your dish must be installed in a location where it will not be prone to excessive movement. Smaller dishes, such as 30" can be mounted to a building or roof. Larger dish sizes should probably be mounted to a firm pole in the ground, reinforced with concrete. The LNBF or LNB is the device at the end of the dish arm that collects the signal, amplifies it and sends it to the receiver to be decoded. Ku band systems use an LNBF (Low Noise Block Amplifier with integrated Feed) and large C band systems use an LNB(Low Noise Block Amplifier) with an external feed horn. Most dedicated Ku band systems use offset dishes, meaning the dish is designed in such a way that the LNBF is offset towards the bottom of the dish so as not to interfere with the signal. This allows a smaller dish size as opposed to large C band systems which locate the LNB at the focal point or center of the dish which tend to block out a portion of the incoming signal. Ku band LNBF's are measures in DB (Decibals). A good quality Ku band LNBF will have a rating not above .6db. A superior one will be .5db or lower. There are also 2 distinct types of Ku band LNBF's. LNBF's designed for use with direct to home satellite services such as Directv or Dish Network which use circular polarization and are not compatible with free to air satellite signals. For all free to air signals, you will want a linear Ku band LNBF as conventional Ku satellites use linear (horizontal or vertical) polarization. HH-Motor if you want a moveable dish. Also known as a satellite dish positioner or dish mover, this is the electric motor device that moves a dish from left to right (azimuth) and up and down (elevation) in order to receive programming from multiple satellites. If you only are interested in programming from a single satellite, you will more than likely not require one of these devices as your satellite dish will be fixed in one constant position. However if you wish to receive signals from multiple satellite, you will need a dish positioner. Most recent quality receivers now come with a feature known as DiSEqC (Digital Satellite Equipment Control), which can control a dish positioner directly. However if you have an older satellite receiver than does not support this feature, you will likely need to purchase a separate dish positioner control if you wish to track multiple satellites. Ku-band and FTA installation can be difficult due to the close 4 degree spacing and medium power of the satellites. It is more tricky to locate and peak a Ku-band system. Special expensive meters make the job easier. Dish Network and DirecTV satellites are high power satellites with circular polarization and much easier to locate and peak. Call SATPRO so your installation will be correct and trouble free. making them stay in a fixed location. If each satellite had a bright light on it, the satellite arc (the Clark belt) would look like a rainbow at night with the lights going from the east horizon to west horizon in the southern sky and at a maximum altitude of about 50 degrees from Atlanta, GA at the highest point overhead. They are spaced about 4 degrees apart. You can only see and receive signals from the satellites over your side of the earth, you cannot see the satellites below the east and west horizons. If you move to Europe, you will no longer be able to get the same satellite programming you did while you were in the United States. Each satellite location has a location name, such as 119w for Dish Network, 101w for DirecTV or 97w for Telstar5 (now G25). A satellites azimuth is the compass direction reading and the satellites elevation is its height in the sky. My FTA Channels are Missing? FTA channels come and go. A channel may be available and FTA for years and then gone. This may happen when the funding for that channel runs out, the programmer goes into bankruptcy, or can no longer afford the satellite transponder rental for that channel, or for some other reason the "plug is pulled". Some channels may change frequencies or transponders on a satellite, or move to a new satellite altogether. In this case, you must make a frequency change in your receiver or move your dish to the new satellite. One must understand that someone has to pay to bring and broadcast the channel to you. Satellite time can be expensive. Occasionally, you may need to scan or search for new channels on the satellite and update the satellite channel list. See: the FCC's 1996 ORTAD rule, under our "Installation & Service" tab. GlobeCast (Now WORLD TV) offers many Subscription and Free-To-Air channels. Call for a system price and programming rates for your country of interest. See www.globecastwtv.com and call SATPRO for your professional installation. Offering:English Korean,Albanian, Amharic, Spanish,Croation, Dutch,Polish. FREE Christian and Adventist channels All Free-To-Air. About 30 Christian channels available. ATTENTION BVN DUTCH/FLEMISH CUSTOMERS! Call for Professional install of a BVN system. Ask for a special Atlanta Holland Club price.